There will be a Test – Just Joking! Join us for Social Guidance Sunday’s “Send in the Class Clowns”! This program is special because we have one of IULMIA’s own guest programmers, Courtney Holschuh who not only helped curate the program but also moonlights as a stand-up comedian! Here’s what Courtney has to say about herself: Courtney Holschuh, pronounced “holeshoe”, is a first-year graduate student in the Department of Information and Library Science. An interest in film and archiving brought her to Indiana University to work in the Moving Image Archive. Courtney received her bachelor’s in History from Marshall University in her hometown of Huntington, West Virginia. After an extended break upon completing her undergrad, Courtney’s love for archiving, film, organization, and a “oh my god I’m 30 and not doing anything with my life” brought her to graduate school. Before attending IU, Courtney worked in a public library, made short films, played trombone in a rock band (not a ska band), and did stand-up comedy for attention. Now compelling your attention, Courtney and local comedian Logan Scott Hendry will be performing some jokes as part of this special program! So make sure to join us for some live comedy as well as classic educational film hilarity. As this is our final program of the academic year, we have found some comedic gems that may remind you of the good laughs we have shared over the course of this year. For instance, the first two films may have you recalling our Halloween show, full of horror and safety films. We begin with a Public Service Announcement (Ashes of Doom) which may make you think twice about smoking! The second film, from 1948 is a comedic look at preventative care for workplace injuries. 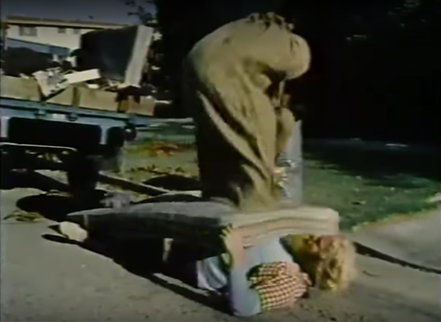 Safe Clothing (1948) is a Canadian film, but you wouldn’t know it from the narrator’s accent. It is reassuring to know that the Department of National Health and Welfare and the Department of Labour of the Government of Canada have our best interests at heart. But maybe you’ll prefer to slip into something more comfortable. In that case, we present The Baggs, a silent film story about a man that catch quite catch a break from some unlikely burlap sacks. But if burlap isn’t your style, how about some creams or moisturizers for those baggy eyes? Maybe you’d be interested in learning about all of the different deodorizers, bronzers, and perfumes for your “strategic zones”? Marshall Efron introduces us to the creams, salves, balms, and sprays that will help him transform into the perfect, irresistible man. You, Irresistible You features few short skits hosted by Marshall Efron, a Danny Devito/Zach Galifinakis-type who puts the pathetic in pathos – making you reconsider that bronzer, that waterbed, maybe even that mindset that you need to be perfect. Welcome to the so-sad-it’s-funny portion of the programming! We have reached our self-help section of the program which means you’re going to need some help with oral communication. Learn from Carol who needs to expand her paper route but won’t be able to do that until she can properly convince her neighbors to subscribe to the paper. Luckily, she’s got local politics working for her, a trusty duck to pop up at the right moment, and the best frenemy a young entrepreneur could ask for! See how she overcomes her obstacles and improves her oral communication skills in What Did You Say? 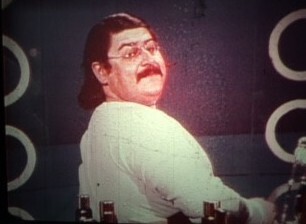 (1983). Poor Susan got a door swung into her while she was carrying a tray of drinks. 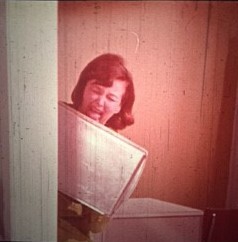 Her pain is our pleasure when we watch the hilarious high jinx abound in “You and Office Safety” (1970). To close out this program, we will spend some time with Harlem Globe-Trotter, Meadowlark Lemon (1979). With the help of some funny costumes, a pet gorilla, and a bunch of balls, Lemon teaches us about directions, latitude and longitude lines, and what to call the different parts of the world. Previous Previous post: Celebrate a Sweet 16…. Millimeter Film Program!